Note: This article was published during the development phase of Drupal 8. The details and version numbers are now out-of-date. Please follow the most recent documentation on the Drush website. When I first started learning Drupal, I remember the process of enabling and disabling modules on the Modules page took for-ev-er. My laptop was in serious danger of getting hurled across the room due to my frustration. Then I discovered drush, and I could download and enable modules with ease instead of pain and suffering. Of course there's a lot more you can do with drush than just download and enable modules; this is just one example. 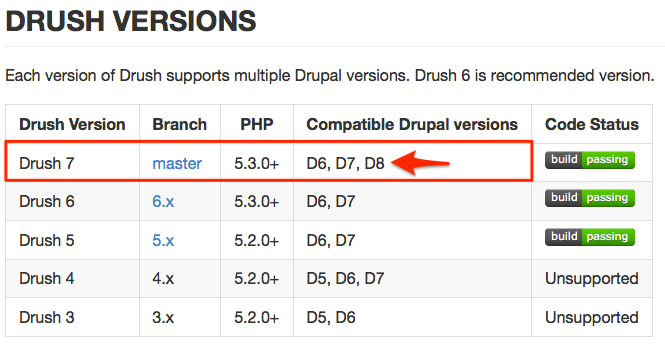 Drush 6.x only works with Drupal 6 or 7. If I wanted to use Drush on my Drupal 8 site, I would need to upgrade to Drush 7.x. I followed the instructions in the error message (which I think means to say "Drush 6.1.0 does not support Drupal 8"), which tells me to see http://drupal.org/project/drush for more information. Once there, I find that the Drush project has been moved to GitHub. So over to Drush's GitHub project page I go. There's a lot of documentation on this page, and this compatibility chart tells me which version of Drush I need for Drupal 8 (Drush 7.x) and which branch of the repo I'll need as well (master). But before I dive into downloading the master branch, I scroll down to try and find upgrading instructions. Sure enough, there's an Install/Update section with instructions about how to upgrade Drush using Composer. This ensures that when I type in composer commands, my shell knows which program to run, without needing the full path to the executable. And, presto! I enter drush status into Terminal and I can see that I'm now running Drush 7.0-dev and Drupal 8.0.0-dev. Now when I type the drush command drush dl page_manager and drush en page_manager inside my Drupal 8 site, I get results, not errors. This error usually means that you need to invoke drush from within your Drupal site. So cd into the directory where your drupal root is and then try using drush again. Drush used to update all the modules and themes - even those that are not enabled, and this was good for a multisite (aegir) environment when site admins will want the secure, bug-fixed latest release of a module or theme. Now with drush 7.0-dev, drush will only update enabled modules and themes. Is there a flag to the up command in 7.0-dev, or is there a new command to update all modules and themes? Is this really the new INTENDED behavior of drush 7? Thank you very much. Very helpful. Was a bit confused on this one. Just a note that these instructions still work, despite Drush 7 dropping compatibility with Drupal 8. drush/drush:dev-master now points to Drush 8, which is compatible. This article was published during the development phase of Drupal 8 and the details and version numbers are now out-of-date. Please follow the most recent documentation on the Drush website. As Nick pointed out below, use Drush version 8. Hooooray! All are working OK now. Thank you! This has me totally confused. It looks like this should be solved, but I'm still having problems. I'm trying to update my Drupal 8 site to 8.1.0, but just as this document originally described, I'm getting the error "Drush 7.0.0 does not support Drupal 8." So, I've tried to follow the instructions very carefully to upgrade Drush using Composer. Thanks, in advance, for any help. I'm really trying to learn this. It looks like you might have originally installed Drush 7.0.0 via another method, since the location of Drush script is /usr/local/src instead of /home/fc/.composer. You can run echo $PATH to see the directories, in order, that are being searched for the drush executable. Make sure you are including /home/fc/.composer in your PATH variable in your bashrc (or similar) profile. Thanks, kindly, for the reply. It was the path issue. I was able to find some instructions last night to set path as well as my .bash_profile file and that seemed to get things working. Once again, thanks for helping out. I've tried to add /home/fc/.composer into my path variables but without succes. Hi Kim, what operating system are you running? Did you restart your bash shell program or enter `source ~/.bash_profile` to reload bash_profile? If you're on OS X and not Linux, you will want to add the path '/Users/YOURUSERNAME/.composer' (not '/home/YOURUSERNAME/.composer'). Be sure to enter your own username and not 'fc' ('fc' was the previous commenter's username). Also, it looks like you may be running Acquia DevDesktop. If so, if you are on the latest version, you should have Drush as part of that. According to their https://docs.acquia.com/dev-desktop/whats-new, Drush 8.0.5 was added in March 2016. Hi Ambermatz, thanks for your answer. I'm running on OSX. Very stupid of me I did not replace de fc with my username. I've just installed DevDesktop so I will take a look on the pages you provide, to get this working via DevDesktop. Deleting it in /etc/paths and ~/.bash_profile and reloading bash_profile doesn't seem to remove it. The path were concatenated, how can I undo this? Restarting the iTerm application solved the issue with the faulty path variables. But still the old drush version is loaded my path variables are shown below. The composer folder is located at the above location (/Users/kim-private/.composer) and the drush folder is located at (/Users/kim-private/.composer/vendor/). P.S. I rather us the composer drush version instead of the DevDesktop because I prefer using iTerm instead of the default terminal DevDesktop is uses. I also read using the composer version is give more flexibility in changing drush version afterwards. Issues fixed, drush was installed via homebrew. I've update it via hombrew and now it's working in de latest version.